Before firing up the Sandman van and heading down the Peninsula, 56km runners please note that you will start and finish at Cape Schanck. See 'The Trail' page for more information. 28km Runners start at Dromana and finish at Cape Schanck. Transportation links on the links page. IMPORTANT. 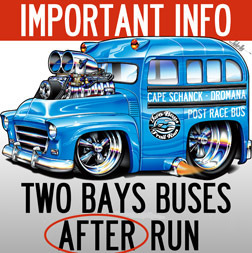 Buses leave Cape Schanck AFTER the run to take 28km runners back to Dromana. See Entrant Info Book. Topics in alphabetical order. B is for Buses. Cape Schanck is the endpoint of the run for 28km runners, and the start/finish for the 56km runners. Be aware there are no taps with drinkable water at Cape Schanck when training.